As eclectic and vibrant as the city it is housed in, Trident, Nariman Point is amongst Mumbai's most acclaimed fine dining destinations. From European and Indian cuisine to delicacies of the Far-East, you can savour a wide range of authentic, international flavours in our award winning restaurants and bar. The bright and cheerful Frangipani restaurant serves Mediterranean flavours from early morning until late night. Our bar, Opium Den, serves a selection of spirits and innovative cocktails. From a morning cup of coffee at The Verandah lounge to a five-course meal at India Jones, dining at our hotel promises to be an authentic, versatile and memorable experience best enjoyed with family friends or esteemed business associates. 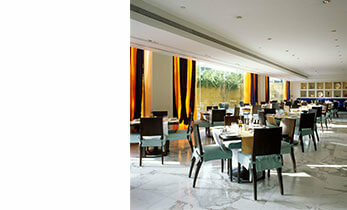 Frangipani, the all day dining restaurant, serves fine Mediterranean cuisine. Lunch - 12:30 p.m. - 3 p.m.
Dinner - 7:30 p.m. - 11 p.m..
Savour fine Thai, Japanese, Vietnamese and Korean flavours at our award winning restaurant: India Jones. Lunch -12.30 p.m. to 2.45 p.m. The Verandah is a casual lounge restaurant open round the clock. Opium Den is a trendy bar that offers a fine selection of spirits, wines and cocktails.